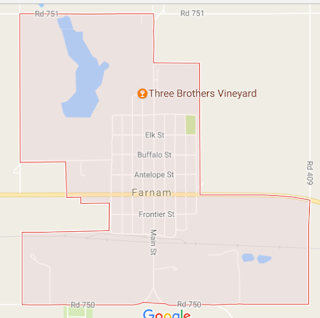 Farnam is another small town situated along the HiLine - Highway 23 in south central Nebraska. 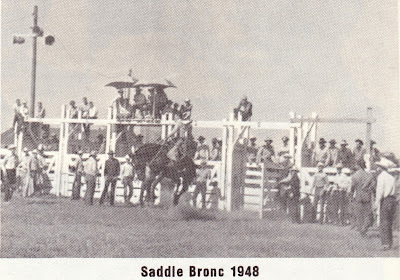 The population was 171 at the 2010 census, down from the all-time high population of 462 in 1910. 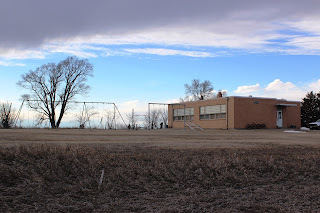 It is a typical small town in rural Nebraska. Quiet residential neighborhoods, many with unpaved streets, a closed school, and a few, very few, main street businesses operating in historic buildings dating from a more prosperous time. 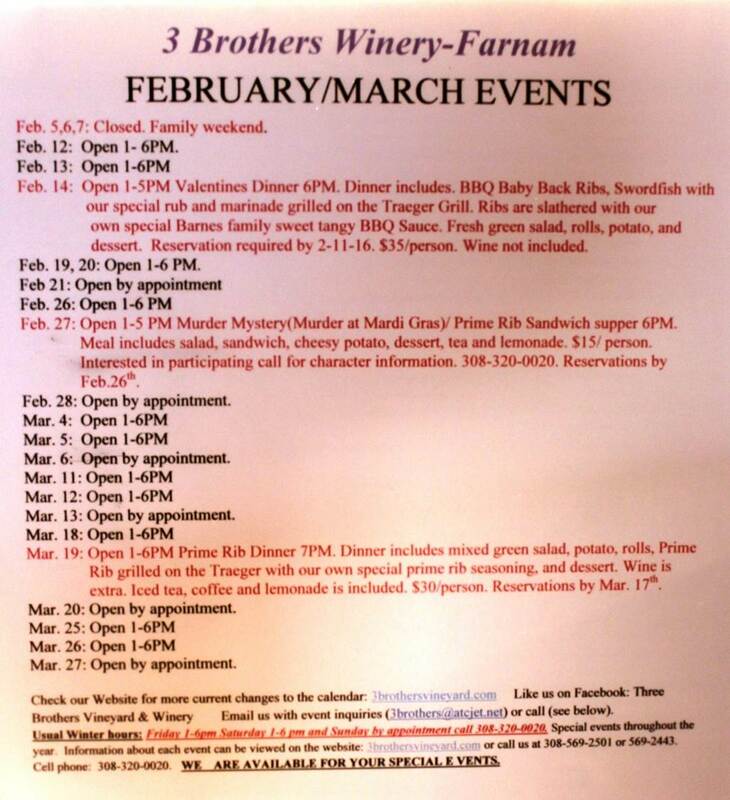 Our reason for visiting Farnam was to enjoy the 3 Brothers Vineyard and Winery. A delightful find in a small town. 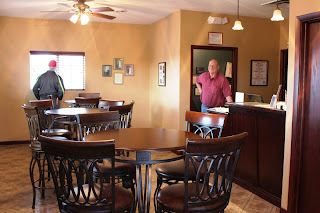 3 Brothers is located at 812 Lincoln St., in the northwest corner of the community. 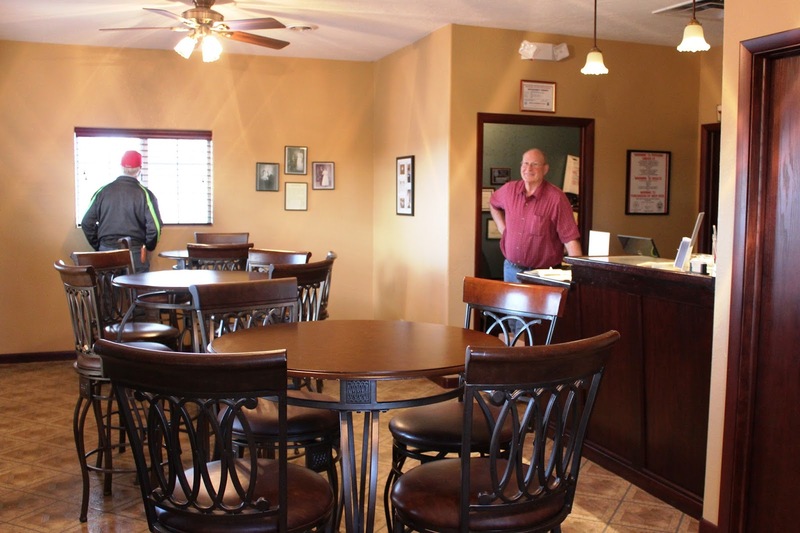 3 Brothers is located in an unprepossessing building that belies the warmth of the interior. 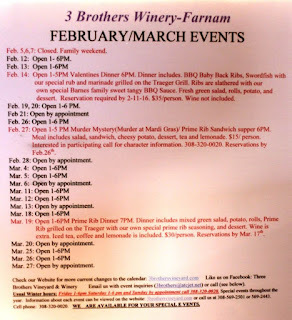 According to their website: "Three Brothers Vineyard and Winery takes its name from the three Wach brothers Hermann Julius, Friedrich Wilhelm and Otto Rudolph. 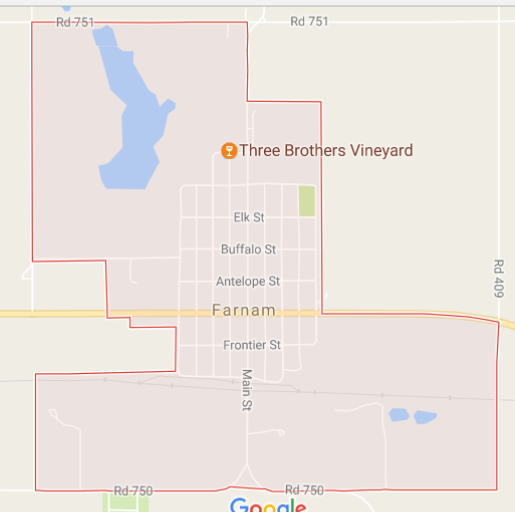 Two of the brothers, Hermann and Friedrich, were born in Worms, Russia in 1879 and 1884 respectively, while Otto was born in Hayes County, Nebraska in 1889 after the family homesteaded in the area. They are among 15 children of Friedrich Hermann Wach who was born in East Germany, but immigrated to Russia in 1852 to seek his fortune as a maker of leather harnesses. Russia, under the Czar, was inhospitable for Germans, so at the age of 54 he moved his family to America arriving on the same day as the Statue of Liberty, June 18, 1885. Family folklore says the family arrived on the same ship as the many crates that were carrying the statue. 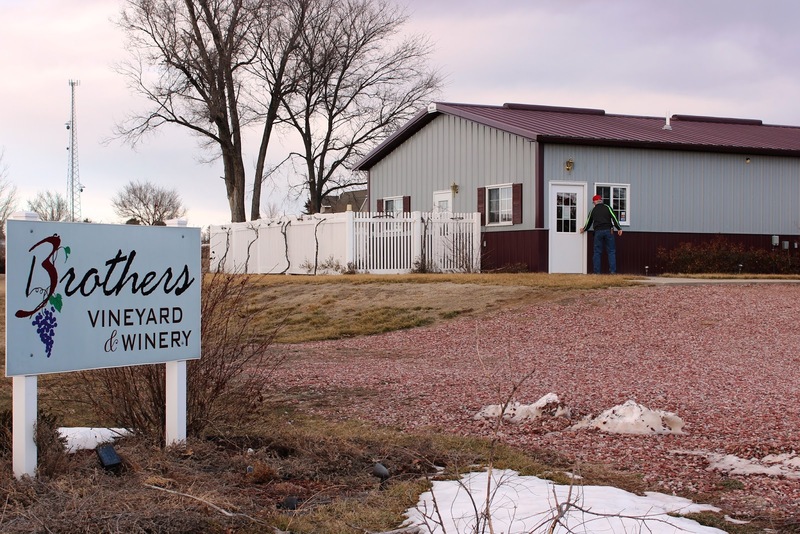 Traveling by train to Sutton, Nebraska to meet family, the Wachs soon homesteaded in Hayes County, 50 miles west of 3 Brothers Vineyard location. Later, these three brothers married three sisters from the Schultz family. Hermann married Anna Karolina in 1909. Friedrich married Emilie Elisabetha in 1912. Otto married Johanna Frieda in 1919. 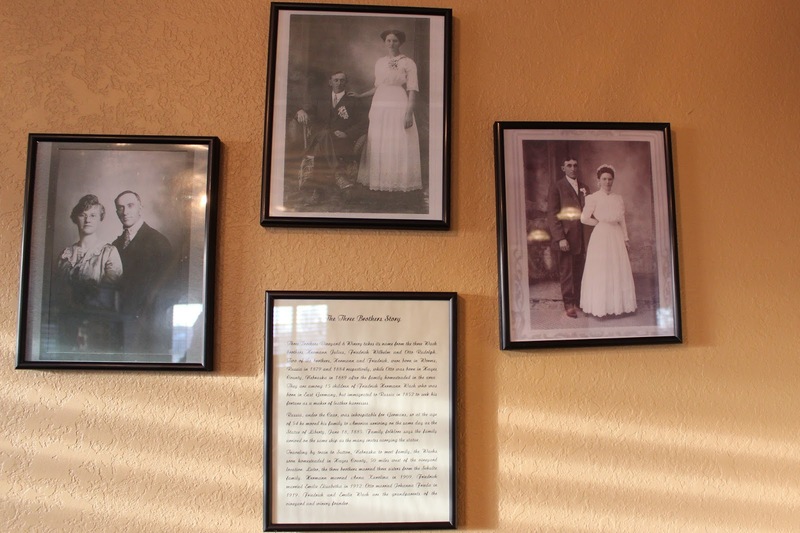 Friedrich and Emilie Wach are the grandparents of the vineyard and winery founder, Gary Wach. The pride in their German/Russian heritage is evident. According to census data, 29% of Farnam residents claim German heritage, while 13% report Irish. 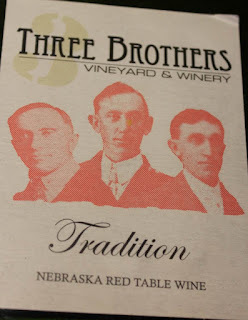 3 Brothers is a wonderful find in rural Nebraska. The small tasting room and adjacent outdoor patio provide the perfect setting to enjoy a glass with friends. 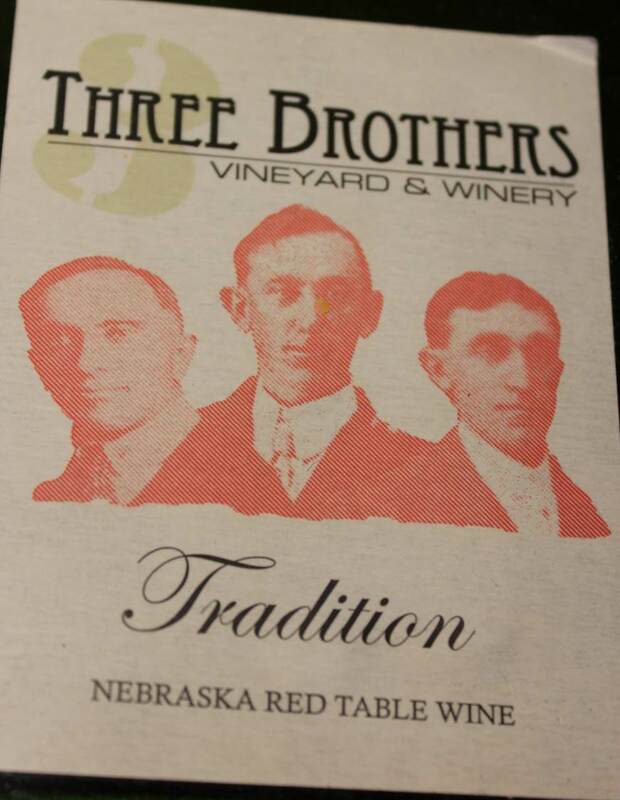 They have a selection of Nebraska reds and whites, plus, if you're there at the right time, you can enjoy appetizers or a meal.